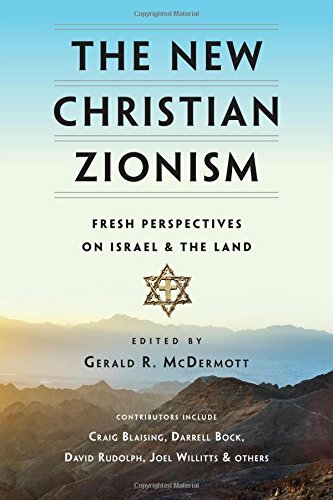 In The New Christian Zionism: Fresh Perspectives on Israel & the Land, Gerald McDermott and others make their case against replacement theology (supersessionism) – the idea that the modern Church has replaced Israel and that the Jewish people and the land of Israel play no real part in God’s plan for the future. What makes this book unique is that they are not arguing for a traditional dispensational view. Rather, this text offers a third solution that neither neglects the role of the Jews and the land of Israel nor does it give them the blanket conversion clause so common in dispensational theology. This first section sets the stage for the conversation at hand. Editor Gerald McDermott lays out the history of supersessionism and it’s counterpart. This section is, for me, the most important section in the book as various scholars argue from the biblical text. I will spend the majority of the time assessing this section below. The third section of this book traces the implications of supersessionism and Zionism in the church, history, and politics. Section four is another bright spot as Darrell Bock concentrates on distilling the book down into a few, important, points of emphasis. McDermott sets the stage well, and brings the reader up to speed on the history of the conversation and differing opinions regarding Israel and the church. Craig Blaising’s Essay (pg. 79) was unconvincing. He proposes a better understanding of the ethnic, national, and territorial future of Israel based on a reading of the Old Testament that is, in his words, in continuity with the New Testament. However, in the middle of his argument Blaising conveniently jumps from Romans 9:4-5 all the way to chapter 11. I found it convenient that he fails to address the texts most glaringly problematic to his argument (the remainder of Romans 9) – making this portion of his essay deeply flawed. Blaising goes on to propose that the current state of Israel is a “preconsummate work of God” working towards his divine plan for Israel. Blaising rightly admits that several reconstitutions of Israel have taken place after the ministry of the OT prophets. He argues, however, that the current reconstitution of Israel is the divinely orchestrated plan of God. He loosely ties this conclusion to biblical texts, but too loosely to be convincing – especially considering that he never does deal with the remainder of Romans 9 in order to rightly point out to whom all of these promises apply. In his essay, Joel Willitts does well to draw attention to the fact that, “Matthew’s Gospel is not about the territorial restoration of the land of Israel. If Matthew is about something, it is about the identity and significance of Jesus of Nazareth as Israel’s long-awaited Messiah ben David.” This is an important clarification concerning Willitts’ hermeneutic and reduces some initial skepticism to the title of the chapter. He aims to make that case that Matthew, “had an abiding land consciousness in line with the traditional Jewish territorial hope.” His case is well-made and convincing. For me, the most important chapter of this book comes from David Rudolph. While Willitts and Kinzer make important contributions to the conversation, the Pauline corpus is the most important battle ground on the subject of Zionism. Rudolph begins his chapter with two rather long excerpts from N.T. Wright (a known supersessionist) in hopes of refuting the convictions of one of the most notable NT scholars still alive today. This takes some chutzpah. The first portion is his essay defends his conclusions against some common texts referred to by transference theologians. Rudolph seems to shoot himself in a foot a bit when he notes that Paul’s aim in 1 Cor. 7:19, Gal. 5:6, and Gal. 6:15 is to say that, “neither circumcision nor the lack of circumcision has ultimate bearing on salvation.” If this is the case, and Rudolph admits this, how can it be that he plans to contend for the idea that Israel’s election is sure? Based on what? If their election is not based on their “Jewishness”, then what is is based on? While the first portion was not persuasive enough to change my views, Rudolph’s arguments in his second section – “Argument for Particularity” – gain steam and he gives the reader much to consider. Of specific help was the attention that he draws to the present tense usage in Romans 9. Israel having a future does not negate the centrality of Christ. Zionism is not as nationalistic as some might think. We must focus on and seek after the hope of reconciliation between Jew and Gentile. Israel has a legal right to their land and nationhood. I am thankful for this book. While I am not convinced by all of the arguments contained therein, I am able to see past some of the disagreements that I might have with the authors to the heart of this book. Christian Zionism has become increasingly unpopular and, sadly, many who have deep affections for Israel and the Jewish people are dismissed as a bit off their rocker. I am thankful to Gerald McDermott and his colleagues for moving this conversation forward and am equally thankful to the team at IVP for considering this book. So, brass tax. Should you read this book? Is it worth the money and time necessary? It is well worth the money. Priced at $14.99 on Kindle and $22.20 in paperback, this book is a steal considering the wealth of knowledge contained within its pages. It depends on if this conversation is important to you. The authors of this book would maintain that this conversation is important for all Christians, and I agree to a certain extent. But it would be foolish to assume that this book is vital for all readers. If, however, you have developed some opinions of the conversation at hand, this book is an important addition to the conversation and should garner your attention and investment. You can buy it from the Amazon link below.